The most successful system ever for players preparing for the NBA Draft. "It’s great to have the opportunity to work with these young guys and get them started on their NBA careers. They put in a lot of work and had tremendous focus to get through this process. We are thrilled we had a chance to prepare them and know they will all have successful careers as a result of their continued hard work and training. After 20 years of doing this, it never gets old to be able to help someone achieve his dream." Starring at Stanford for 4 years prepared Josh for the rigors of training for the next level. But despite a very productive career, he was still overlooked early in the NBA draft process. He had to improve in many ways to prove that he could contribute in the NBA. He did this and much more at Impact, as he went from projected to be undrafted to selected 29th in the first round by the Oklahoma City Thunder in 2014. His story is now well-known, but coming out of college in 2011 he was not expected by many to have the NBA All-Star career that he now is on the path toward. Being undersized and underappreciated fueled his grueling daily (and nightly) training sessions at Impact that ended up with his selection as the final pick in the draft by the Sacramento Kings. Unheralded during his stellar career at Norfolk State, Kyle spent his summers at Impact training and improving his game against veteran NBA players. After a vast improvement over multiple summers of training, Kyle’s college career culminated with a historical victory in the NCAA Tournament as a 15-seed. He then raised his level even further during the Impact Pre-Draft program and people took notice; he was selected 49th in the 2012 NBA Draft by the Orlando Magic. After a junior season in which he averaged 6pts and 5rebs, Rakeem spent a tireless summer training at Impact and returned to school to average 17.5pts & 9rebs, earning himself All-ACC honors. His climb up the draft boards ensued, ending with him being drafted 36th overall by the Indiana Pacers in the 2015 NBA Draft. Sporadic playing time in college didn’t allow Myles to fully showcase the talents that are so evident now. Therefore, he had much work to do to train for the 2015 NBA Draft. At Impact, with an absolutely relentless work-ethic, Myles reconfigured his body and proved he can do everything necessary to excel in the NBA, resulting in him being selected 10th overall by the Indiana Pacers. 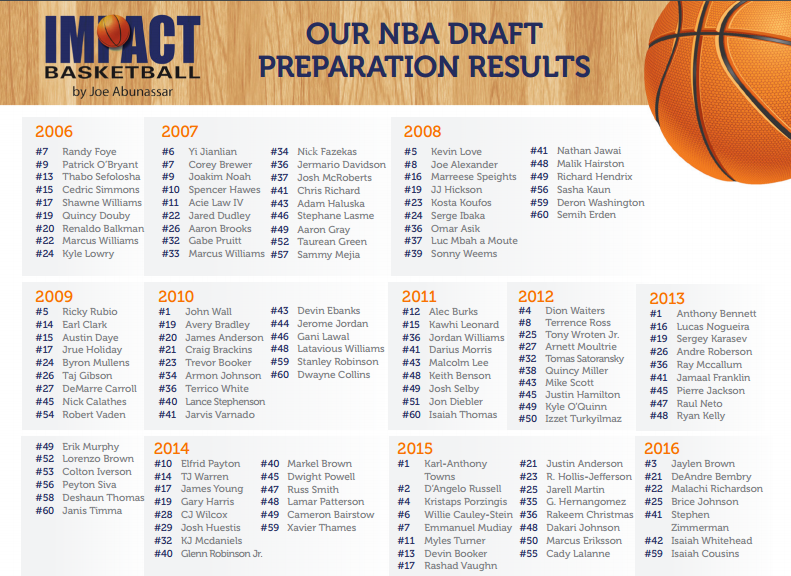 While at Impact training for the 2010 NBA Draft, Jeremy competed and succeeded every day against other more heralded point guards from bigger colleges, most of whom were projected ahead of him and eventually selected in the draft while he watched. By earning his way into the NBA with a determined and unwavering belief in himself, Jeremy’s career has taken off. Media and interview training. NBA situational analysis. Draft process preparation. The Impact Training staff is proud to have worked with all of these draftees, as well as hundreds more Free Agent signers, over the years. For the full list, open up our Brochure here. *NCAA rules changed permitted potential draftees to train on campus for the first time.